Shani relates with every work and its fruits in our life. Shani is the overlord of punishment. Shani gives employment and we can work. If Shani is weak then struggle increases in every field. A person faces problems in employment and face. However, struggle decreases and one gets success in life, if Shani is favorable. Rudraksha means rachis of Rudra. Rudraksha is origin from the tears of lord Shiva. Since ancient times, it is used as jewelery, psalm and to control planets. We can reduce pain and get mercy of Shani by using Rudraksha. However, one should follow rules of wearing Rudraksha. Wear Rudraksha in wrist and throat. Wear Rudraksha in throat, for Shani, on Saturday. Offer it lord Shiva before wearing it. Keep your conduct and behavior clean. Employment: Wear one face Rudraksha. Wear it in red thread in throat on Saturday. It is extremely beneficial to wear three and ten face Rudraksha. Health: Wear eight faces Rudraksha in throat on Saturday. You can wear one eight faces or fifty four Rudraksha. Sade Sati/Dhayya: Wear Rudraksha garland in throat. 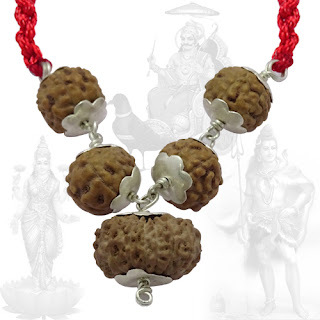 It is extremely beneficial to wear five faces Rudraksha. Chant Shani and Shiva psalm before wearing it. Vish Yoga: Wear one face and eleven faces Rudraksha. Keep 1 one face and 2 eleven faces Rudraksha. Wear it in red thread on Saturday. Good Luck: There would be no impact of Shani on devotee of lord Shiva or Krishna. However, they should be honest in their worship.